A Chinese plane-maker is developing a fast, radar-evading armed drone with many of the same attributes as the U.S. military’s F-22 and F-35 manned stealth fighters. At least, that’s what the state-owned Aviation Industry Corporation of China, if not the Chinese government itself, apparently wants people to believe. 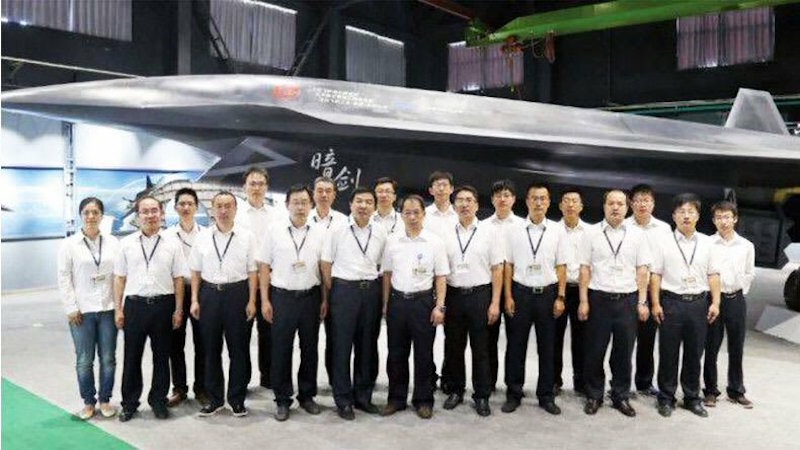 It’s possible that the Dark Sword drone, the first official photo of which began circulating online in early June, is little more than a mock-up. In that case, the drone can’t even fly, much less fight. But that doesn’t mean AVIC won’t eventually turn the mock-up—if that’s what it is—into a functional, front-line weapon that could weigh on the balance of power in the Pacific region. The Chinese military-industrial complex has proved it can develop and produce high-end weaponry, including drones, faster than Western officials once anticipated. The Dark Sword’s first public appearance in its full-size form comes in an undated group photo of 18 men and one woman wearing white shirts and dark pants and badges on lanyards. They’re standing in front of the roughly 30-foot-long drone in a hangar or showroom of some sort. Click here for the full story, on the Daily Beast website.